Ongoing, intensive police efforts continue to show dramatic results in the fight against street robberies in Wrigleyville and Boystown. City data for the final week of August is incomplete, but CWB estimates that the neighborhood ended August with 13 robberies compared to 38 last year. Year-to-date, robberies are down 42%. Even more encouraging: Every month this summer saw deeper cuts in the robbery rate than the month before. The ongoing drive down may indicate that strategies put into place by 19th district Commander Elias Voulgaris are sending a message to criminals who feasted on our streets for three record-setting years. 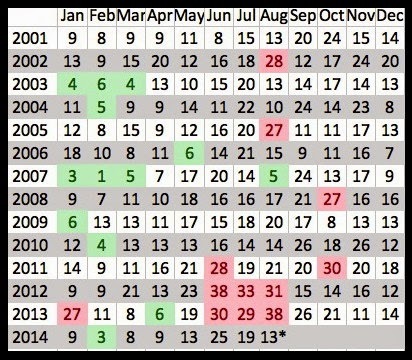 recorded in Wrigleyville and Boystown since 2001.
the 10 worst months. Green the 10 best. There’s more good news. CWB’s tracking of “Unofficial Robberies”—incidents that have clear, strong indications of being bona fide robberies that are not counted in official statistics for a variety of reasons—are down sharply. Between May 17 and August 31 last year, CWB recorded 17 cases in which we believe robberies went unreported. There were only 8 cases during the same period this year. That means fewer victims are failing to get timely police responses and fewer victims are failing to file police reports after calling 911. 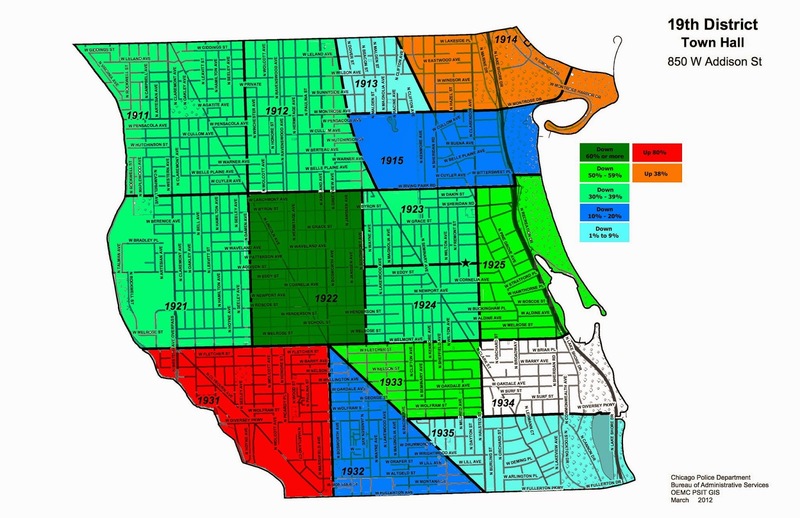 Police beat 1924, which extends from Belmont to Addison and from Southport to Halsted, continues to rank #1 for robberies over the past 90 days. That is due in large part to crimes committed in June. Barring a stunning reversal, CWB expects 1924 to drop out of 1st place in the next 30 days. 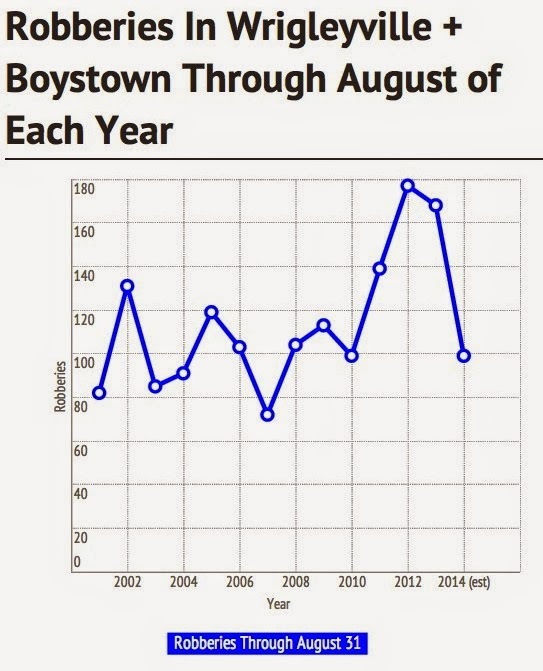 Robberies citywide are down 36% between 2001 and the end of July. Had our neighborhood merely shadowed the city’s performance, we would see 99 robberies for the entire year of 2014. We won’t make that. But we’re moving in the right direction. Where Have The Thugs Gone? Across the 19th district, robberies have declined in 12 of 15 police beats. Beat 1931 in the far southwest corner of the district has seen an 80% increase this year—from 5 cases to 9. And in the far northeast corner, beat 1914 has seen a 38% increase—from 16 to 22. Robberies are unchanged on beat 1934. Citywide, the sharpest increase in robberies this year has been in the sleepy 16th district on the far northwest side. 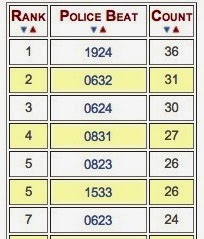 Of the 8 police beats with the greatest percentage increase in robberies this year, 5 are in the 16th district. Beat 1225 around Little Italy has seen year-to-date robberies surge from 9 to 25. Beat 211 in the Douglas neighborhood has seen 49 robberies this year compared to 25 at this point last year. Heh. Heh. Don’t get us started on that one. Good luck, Wicker Park. With shenanigans like that, you'll need it.